We are again thankful to the Marks family for sharing pictures of their Jewish "Palestinian" family from the start of the 20th century, including the picture above of Rachel Churgin's graduating class. Earlier this year we featured the Marks' pictures of Pvt. David Blick, an American who joined the British Jewish Legion to fight the German-Turkish army in Palestine. Blick was one of 500 Jewish Americans and Canadians who fought for the liberation of the Holy Land. According to Blick's biography, "While camped in the area of Rishon LeZion [see here photos related to the battle for Rishon in 1918], he met and later married Rachel Churgin of Yaffo. They were forced to leave Eretz Yisrael by the British." The Gymnasia produced several of Israel's prominent leaders, such as Moshe Sharett, Israel's second prime minister. Its first building, constructed in 1909, stood as a Tel Aviv landmark for half a century. It was torn down in 1959 to make way for the Shalom Tower. View a film of the Gymnasia in 1913, starting at 8:45 in a rare hour-long film of Eretz Yisrael. 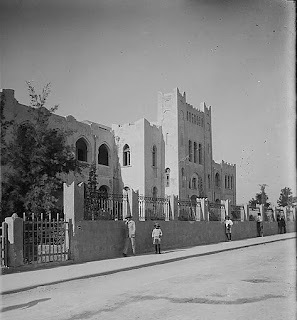 Gymnasia Herzliya was was NOT the first Hebrew-language school, it was the first Hebrew language High school in modern history.